One of the most important theories in the study of electricity is Magnetism. Most Electrical power in the world is created by magnetism. The Greeks discovered it over 2000 years ago when a certain rock was attracted to iron. Permanent magnets are magnets that require no power or force to maintain their field. A basic law of magnetism states that energy is required to create a magnetic field, but no energy is required to maintain a magnetic field. 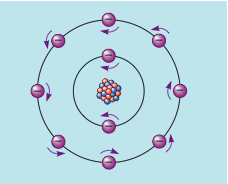 Electrons spin on their axes as they orbit around the nucleus of the atom. This spinning motion causes each electron to become a tiny permanent magnet. Not all electrons spin in the same direction however. Electrons that spin in opposite directions tend to form pairs. These pairs cancel each other out as far as having a magnetic effect on other objects. Only 3 materials actually form natural magnets: iron, cobalt, and nickel. Atoms in a magnetized material are all aligned in a perfect orderly fashion. When a magnet is cut apart, each piece becomes its own magnet. - Diamagnetic materials are either metal or nonmetal materials that cannot be magnetized. Magnetic lines tend to go around them instead of through them. Ex: brass and copper. Magnetic lines of force are called flux. Magnetic lines of flux repel each other and never cross. A basic law of magnetism states the unlike poles attract and like poles repel. A basic law of physics states that whenever an electric current flows through a conductor, a magnetic field is formed around the conductor. Electromagnets need current flow to produce a magnetic field. 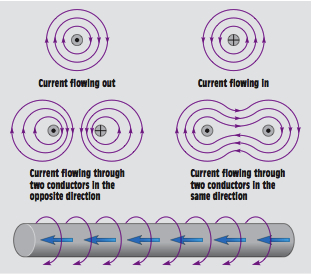 Current flowing through a conductor produces a magnetic field around the conductor. If the conductor is wound into a coil, the magnetic lines of flux add to produce a stronger magnetic field. An increase in current flow causes an increase in magnetic field strength. 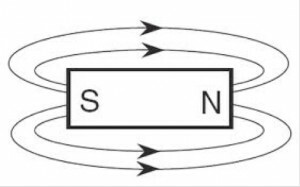 The number of flux lines produced by an electromagnet can be determined by: The number of turns of wire, and the amount of current flow through the wire. The strength of an electromagnet is equal to its ampere-turns. (Current x turns of wire.) The core material is also used to determine the strength of the magnet. The permeability of the core material is its ability to become magnetized. 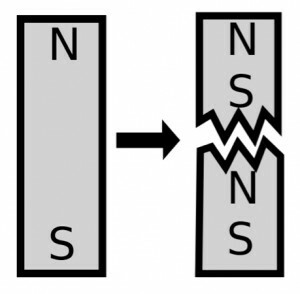 Materials permeability number multiples the strength of the magnet. Reluctance is a materials resistance to magnetism. 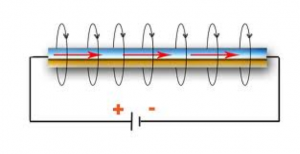 If the current flow in an electromagnet is continually increased, the magnet eventually reaches a point where its strength increases only slightly. This is called the point of saturation. When current flowing through an electromagnet is stopped, the remaining magnetism is called the residual magnetism.